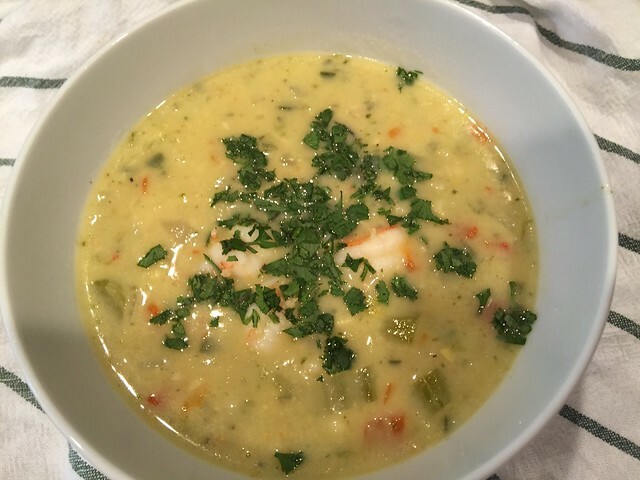 Poblano Corn Chowder with Shrimp is a fantastic new soup that I’m happy to have in the dinner rotation. 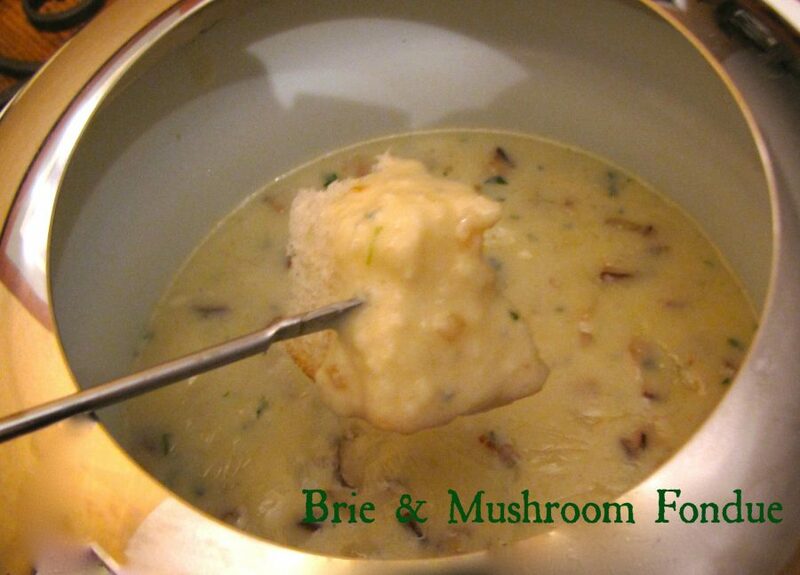 I love soups that simmer all day long or cook in the crock pot, making your house smell great. However, we are all busy people so I need soup recipes that cook in minutes rather than hours. 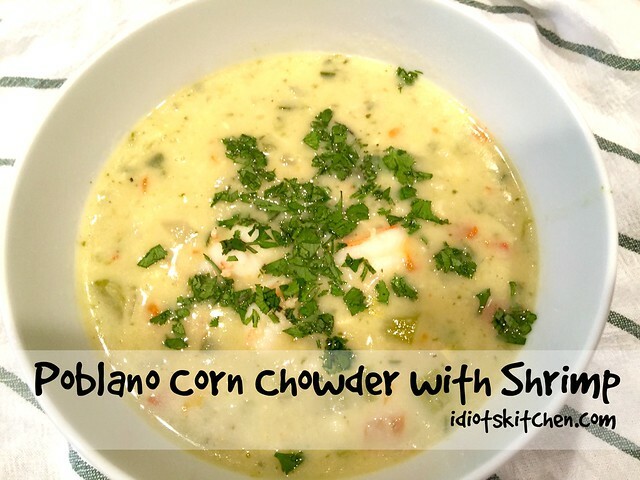 Like my other new favorite, Carrot Coconut Curry Soup, this creamy Poblano Corn Chowder with Shrimp cooks in about 30 minutes. Add 10 minutes or so for prep and that’s dinner (and probably leftovers) done in under 45. Call it an hour if you’re answering emails, feeding the cats, and drinking wine at the same time. 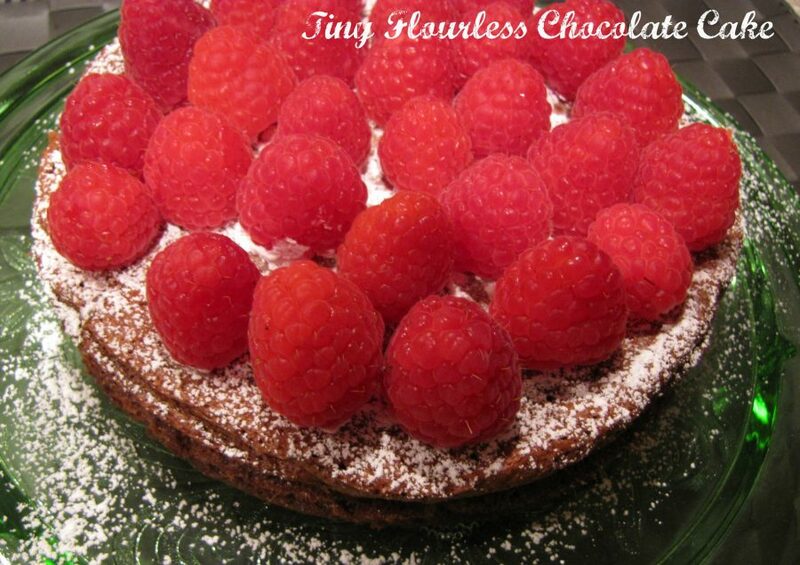 I’ve made this a few times and changed up the recipe a little with each different batch so even though this picture is a little outdated, it’s the only one I had. This recipe originated at Epicurious and called for a whole lotta corn and a whole cup of heavy cream. I’ve swapped out most if not all of the cream for whole milk, dropped the need for a roux completely (one less step and now it’s gluten free), and added more veggies. I’m pretty happy with this latest version. Let’s chop. We have the usual soup suspects here…1 medium onion, 3 ribs of celery, 3-4 cloves of garlic, and 1 red bell pepper. You get a big flavor boost from poblano peppers. They’re not super hot like jalapenos but definitely have a different and more robust flavor than regular green peppers. 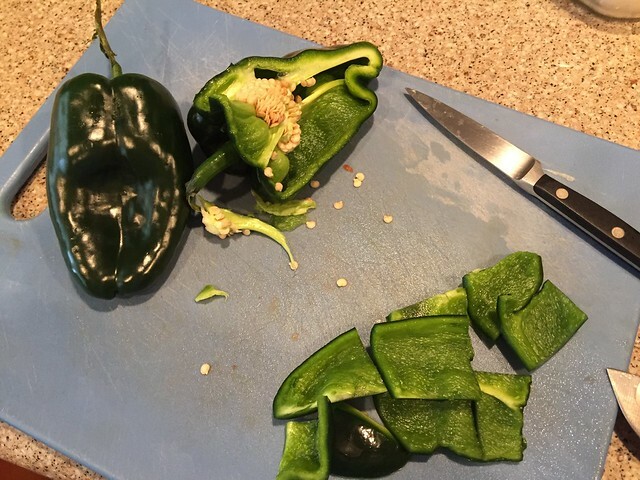 Cut 2-3 large poblano peppers in half, scoop out the seeds, and trim away the white inner membranes. 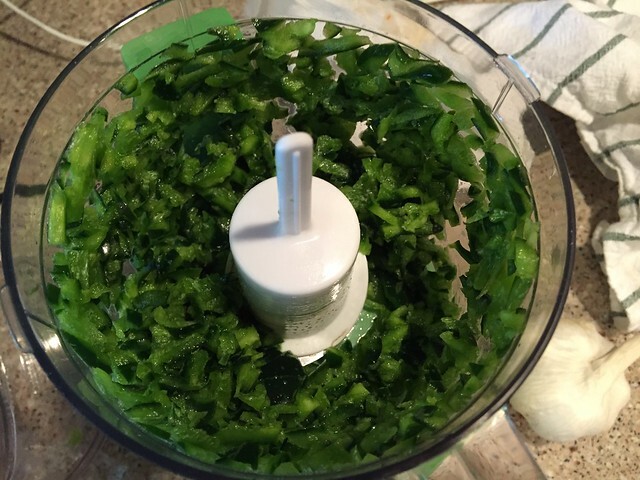 Cut the peppers into big chunks, place them in a food processor, and process the peppers until finely chopped. Of course, if you don’t have a food processor, you can chop these by hand. Now that I think of it, you could also use the food processor to chop all the other ingredients too. Just be sure that you don’t pulverize them into tiny bits. NOTE: Sometimes when I have extra time, I roast the poblano peppers first. This gives even deeper flavor to the soup. You can get poblano roasting instructions HERE. 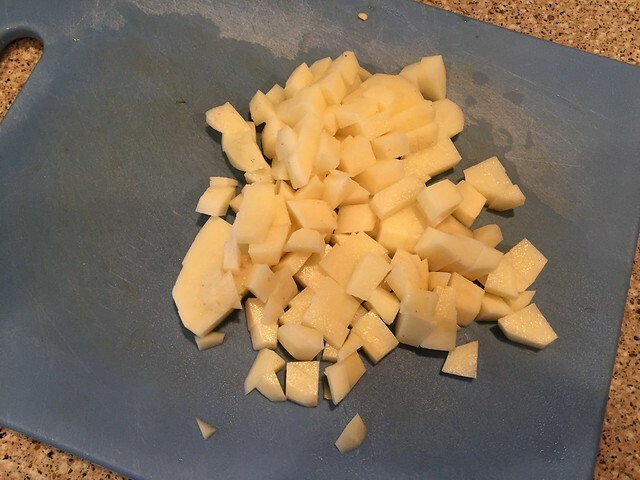 Peel and chop 2 medium potatoes. I have russets but if I had yukon golds or red potatoes I would probably even skip the peeling part. Be sure to peel the potatoes last or place them in a bowl of water so they don’t turn brown. Heat 2 Tablespoons of olive oil in a large soup pot over medium high heat. 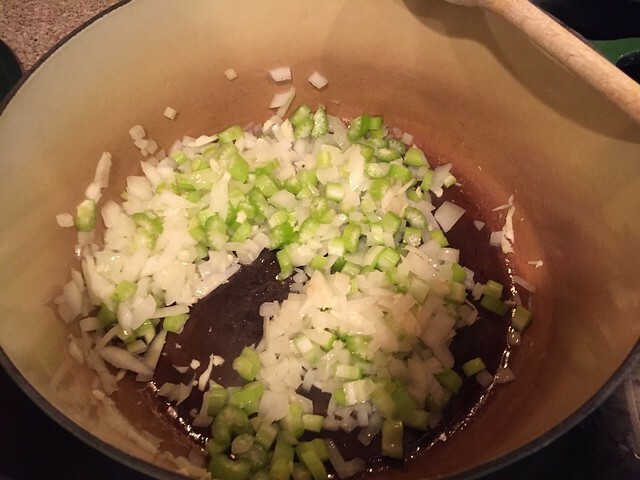 Add the chopped onion and celery and sauté until tender but not browned, about 5 minutes. Now time to fill the pot with the other soup ingredients. 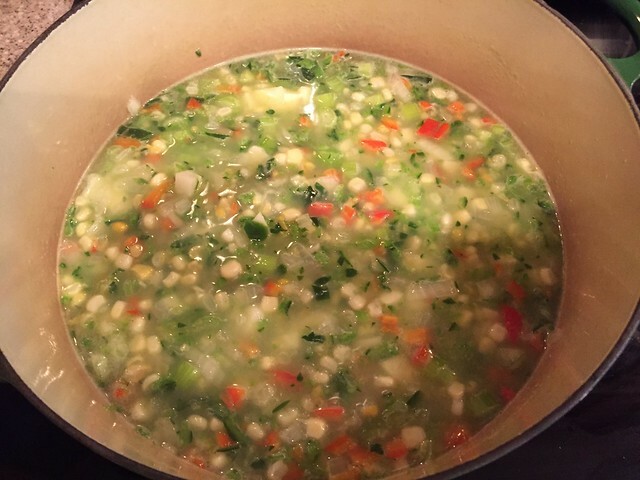 Add the chopped garlic, chopped red bell pepper, and chopped poblano peppers. Pour in 4 cups of chicken broth. You can use vegetable broth if you’d like but the chicken has a bit more flavor. 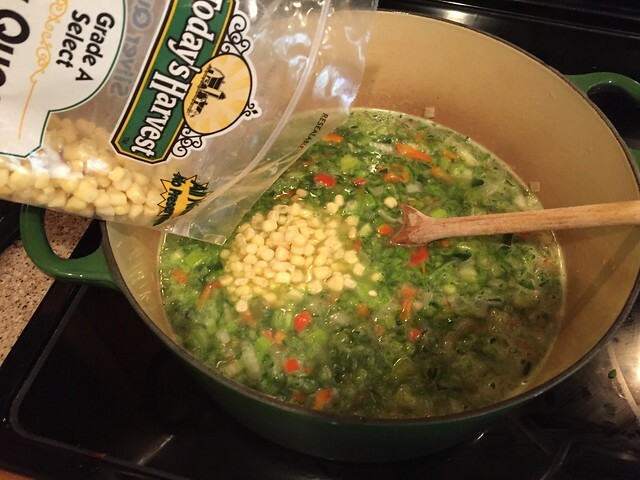 Add 1 pound of frozen corn and 1 (14 oz.) can of creamed corn. Note: If you are gluten free, be sure your creamed corn is GF as well. Most of them are thickened with corn starch rather than flour but be sure to read the lable. 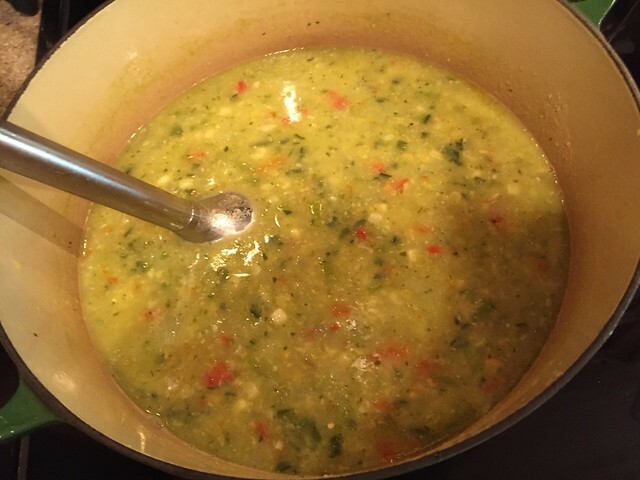 The creamed corn might seem like an odd addition, but it helps thicken the soup. Bring the soup to a boil then reduce the heat to low. Cover with a lid and simmer until the vegetables are tender, about 15 minutes. 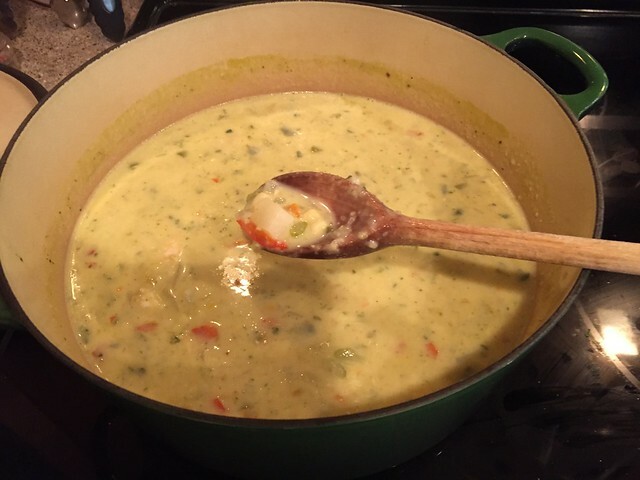 You could leave the soup super chunky like you see in the photo above or blend part of the soup for a smoother, chowder texture. I used my immersion (stick) blender to only blend the soup about halfway. You can see that there are still big, recognizable bits of all the vegetables. I prefer that over a completely smooth texture. If you don’t have an immersion blender, you can dip out 2-3 cups of soup and CAREFULLY blend them in a traditional blender. Remember that hot liquids expand so don’t over-fill the blender and keep a good grip on the lid with a towel. Once your soup is the texture you like, it’s time to add the shrimp. 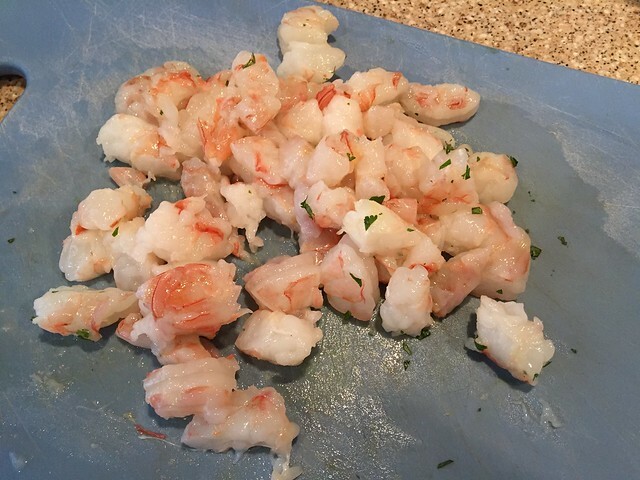 I have 1 pound of large, wild caught shrimp that I have peeled and deveined. If your shrimp are small, leave them whole. Mine were large so I cut them into bite-sized pieces that would fit on a spoon. Add the shrimp to the pot. Pour in 1 cup of whole milk and stir to combine. Bring the soup back up to a boil if necessary, then reduce the heat to low and simmer until the shrimp are cooked through, about 5 minutes. Season to taste with salt, pepper, and a big dash of smoked paprika. If you’re feeling that this isn’t quite creamy enough, add just a splash (maybe 1/4 cup) of heavy cream and that will do the trick. Ladle into bowls and garnish with chopped fresh cilantro or parsley. I love that this is creamy and decadent like a chowder but not so heavy with cream and flour that I feel bad about eating it. The extra veggies give it a big tilt in the healthy direction. Plus I get bonus points for resisting the urge to add bacon crumbles on top. The poblanos give this great flavor without too much heat so if you like things spicy, serve your favorite hot sauce on the side. 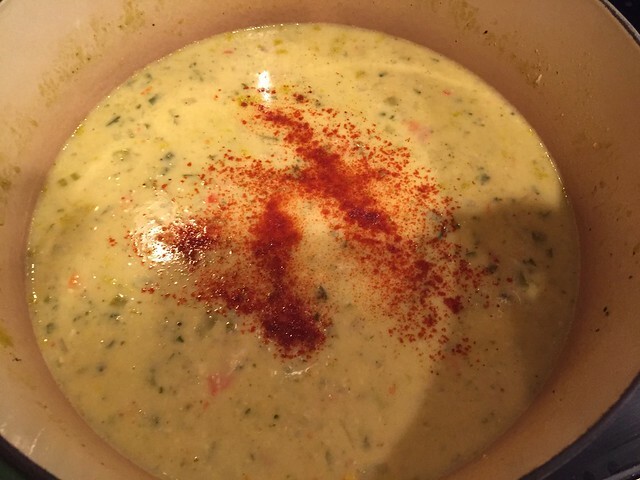 Poblano Corn Chowder with Shrimp is definitely a keeper. 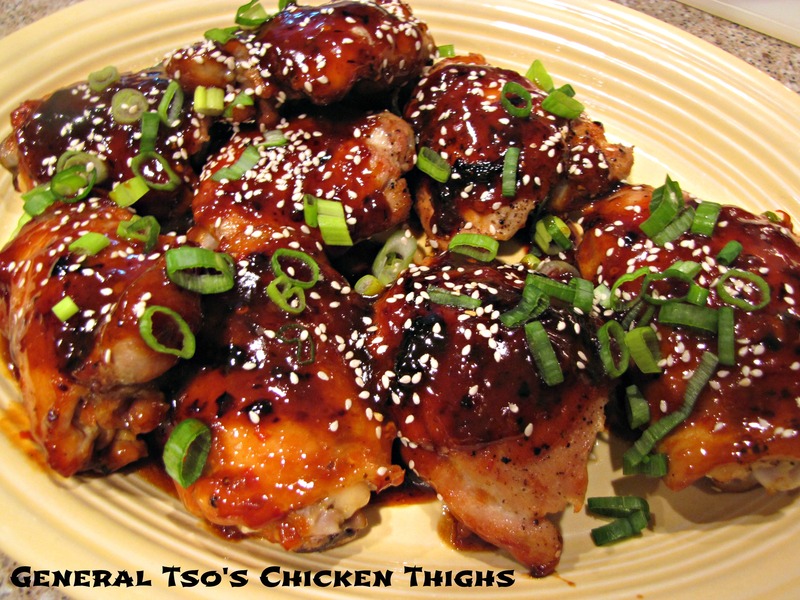 Quick cooking and delicious! 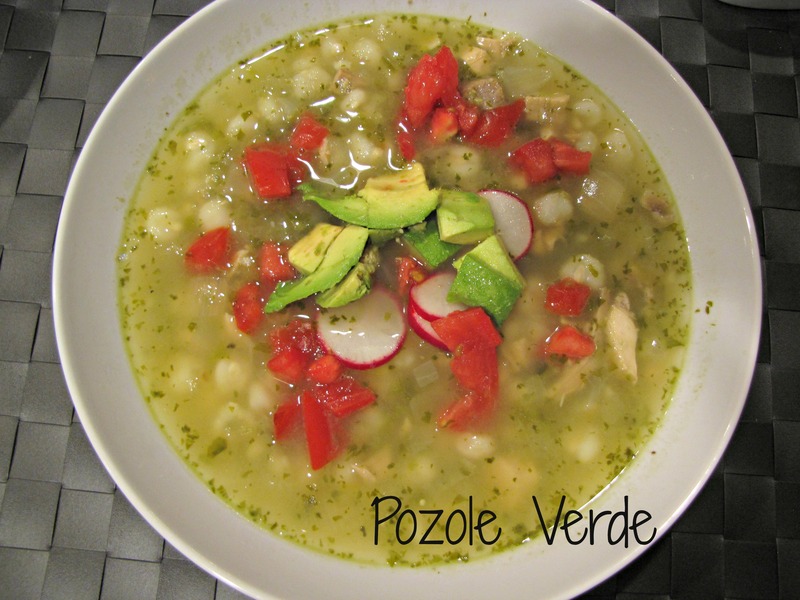 this looks and sounds delicious; oh I love my poblano peppers, I blister mine and peel the skins and use them in salsa with papaya and soups, must try this one. Oh, yum. I wonder about going with coconut milk…….hummmmm. 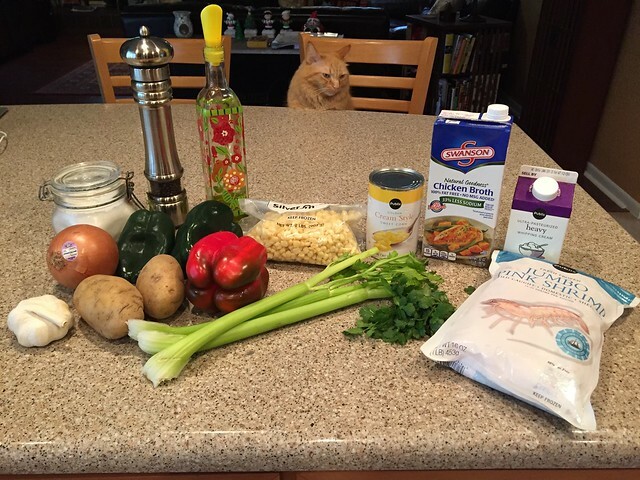 This looks like a fabulous soup! Definitely will make it! I am an absolute soup lover!